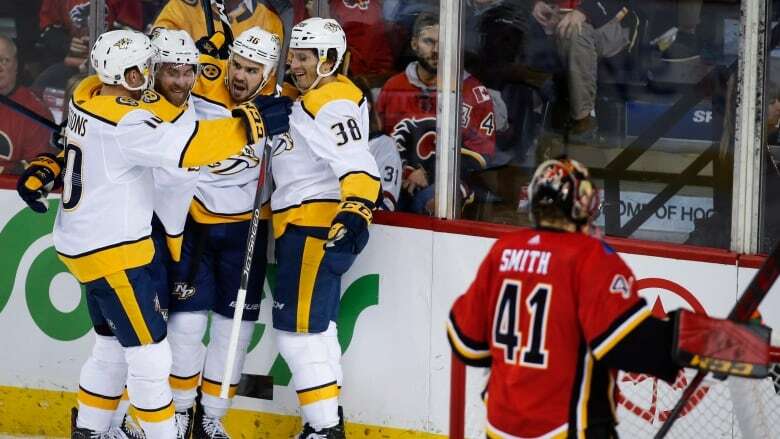 Zac Rinaldo's first goal of the season in the third period was the game-winner on Friday night as the Nashville Predators beat the Calgary Flames 5-3. Known more for his toughness, Zac Rinaldo showed a different side of his game on Friday night. Rinaldo's first goal of the season on a perfect shot at 6:31 of the third period was the game-winner as the Nashville Predators beat the Calgary Flames 5-3. After Noah Hanifin got caught pinching, Rinaldo broke out on a two-on-one with Ryan Hartman and hung onto the puck the whole way before beating Mike Smith on his blocker side with a wrist shot into the top corner. In career game No. 335 for the 28-year-old, it was only his 15th career goal. "That's what I live for. That's what I play for. I play for pride. I play for the team," said Rinaldo. It was the fourth time Nashville took the lead in a back-and-forth affair. This time, they held it. "The bench was pumped up," said Predators coach Peter Laviolette. "Just a great, great play. We ended up catching numbers going the other way. He made the right decision, made a great shot." Saros entered the game at 5:09 of the third with the score tied. Just a couple minutes earlier, Sam Bennett made it 3-3 when he took a slick pass from Derek Ryan and beat Rinne on a backhand. While Rinne was stretching to try and make the save, Kevin Fiala landed on top of him in an awkward-looking collision. But post-game, it still wasn't clear why Rinne departed. Saros was tested just seconds after he arrived in the crease. Off the ensuing face-off, he had to jab out his right pad to rob Elias Lindholm from the side of the net. Ryan Johansen, Craig Smith, Fiala and Filip Forsberg, into an empty net, also scored for Nashville (6-1-0), which has won four straight. The Predators wrap up their two-game road trip on Saturday night in Edmonton. "We're feeling good," said Johansen. "We understand it's a long season and there's a big process, but we're just going to keep the pedal down and keep continuing to get better." Lindholm, with his team-leading fifth goal, and Matthew Tkachuk also scored for Calgary (4-3-0). The Flames depart for a two-game road trip that begins in New York on Sunday night against the Rangers. The best line for Calgary was Bennett, Ryan and James Neal. The trio had a golden opportunity to tie up it once again at 4-4 when Neal set up Bennett at the side of the net with a hard pass, but the puck went wide of the open cage. "I'm going to have some nightmares about that one I missed, but that's the way it goes," said Bennett. Rinne had 15 saves when he exited the game. Smith turned aside 26 shots in taking the loss. He falls to 3-3-0. Nashville struck first with Johansen scoring 51 seconds into the game. After its first shot, Calgary went over 16-and-a-half minutes before testing Rinne again, with Lindholm snapping the streak, burying a Johnny Gaudreau set-up at 18:43. "Obviously we didn't generate enough offence to start, but we were in the game. We had a chance to win it in the third and tie it up, but some tough bounces."